Submit your ideas for improvements, feature requests, and bug reports. 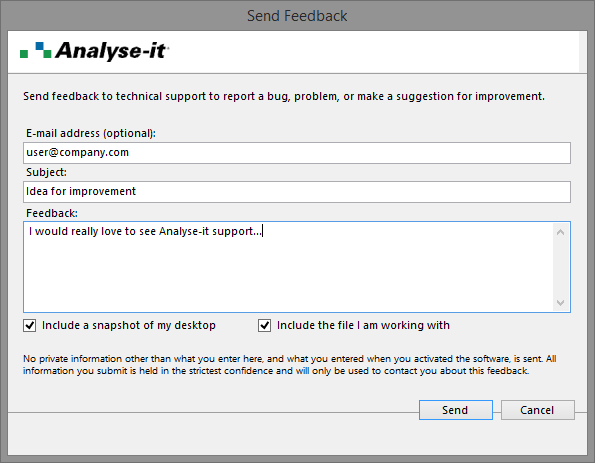 On the Analyse-it ribbon tab, click Analyse-it, and then click Send Feedback. The Send Feedback window opens. Enter an E-mail address where we can contact you. We respect your privacy at all times. We do not collect personal information, and we only use your e-mail address if we need to contact you about your problem or suggestion. Enter a Subject and Feedback to describe your comment, suggestion, or bug report. Include as much information as possible in the feedback, including the steps to reproduce the problem if applicable. Select Include a snapshot of my desktop if it helps to show the problem or suggestion you are making. Select Include the file I am working with to include the active Excel workbook if it contains data that helps to show the problem or suggestion you are making. We treat any data received as private and confidential. It is used only for the purpose you submit it, and we delete it when no longer needed. Your feedback is sent using your internet connection.